It’s the beginning of a new year again, and we’re all full of good intentions. Time to shake those bad habits and stick to the resolutions you made to be healthier. But when it comes to breakfast, it’s all too easy to grab something unhealthy, or even skip it altogether. We’ve scoured Instagram to find the best healthy breakfasts to set you up for the day. And don’t worry. They taste as good as they look, so sticking to your resolutions will be easy this time...we hope. Avocado and eggs are a match made in heaven. And it's not just because they taste amazing, they have some great health benefits too. Avocados are full of 'good' fats that help keep cholesterol low and have been proven to help you maintain a lower body weight, waist circumference and BMI. And eggs are full of protein. Forget the meaty, heavy burritos you're used to - breakfast burritos are all about fresh light fillings. A mixture of scrambled eggs, courgette, tomatoes, sour cream, black beans and salsa, plus any other tasty fillings you choose. A hearty brekkie to keep you going through the day. By switching sugar for honey and mixing in seeds, fruit and oats, you can bake healthy muffins to grab and go in the morning. A hassle-free, delicious breakfast. Start getting your 5-a-day in at breakfast. No stodge, just fresh salad, veg and eggs. You can even make it fruity. We know muesli might not always seem like an exciting option for breakfast. But pancakes? Yes please. Combine the two and you have a breakfast that includes healthy grains and seeds, but you still get to enjoy pancakes in the morning. For a burst of energy that's easy to put together, seeded porridge is perfect. Add your choice of seeds and a splash of honey for sweetness, and set yourself up for the day ahead. 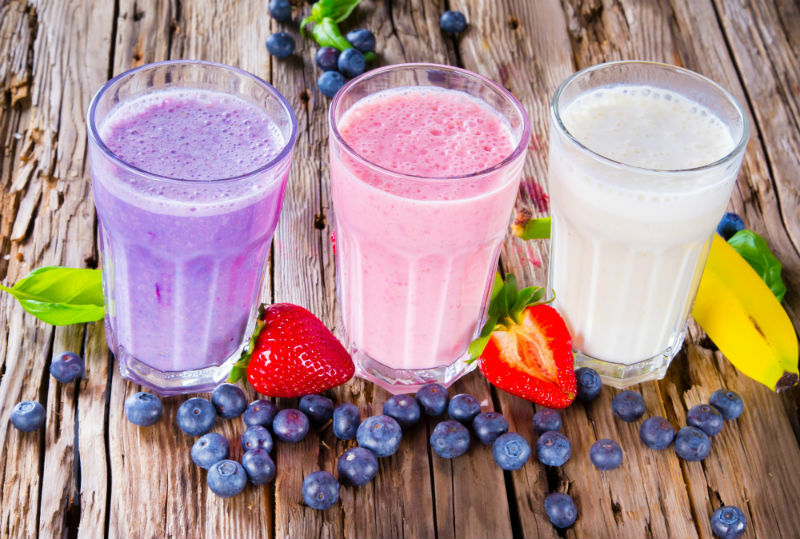 If you don't fancy a big filling breakfast, smoothies are perfect for packing in the nutrients in a way that is easy to swallow. You can choose your ingredients to suit your mood, and add little extras in a bowl, such as berries and nuts if you want a bit more bite. The beauty of breakfast jars is you can add whatever fruit, yoghurt, grains and compotes you fancy. Layer them up, pop the lid on and you're good to go. These portable pots of goodness are great for people who are always on the go. Be creative with flavour combinations. From spinach and mushroom to Shakshuka, baked eggs are full of protein and taste delicious. Cutting out bread? Replace it with this delicious sweet potato toast and find your favourite topping. Another healthy bread alternative. Egg and asparagus are the perfect pair, so try giving them a dip in a rich soft yolk for a brekkie full of protein and vitamins. Experts predict that 2017 will be the year that chocolate creeps it's way onto breakfast menus across the UK, after research showed that dark chocolate has a long list of health benefits. So don't be surprised if it's acceptable to eat chocolate cake before 9am. Finally! Check out our infographic on Super Healthy Smoothie Ideas for more breakfast inspiration. Share any other delicious healthy breakfast ideas you have with us on Facebook.